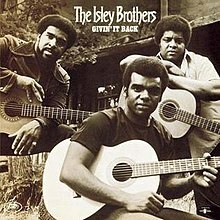 Givin' It Back is the ninth album released by The Isley Brothers on their T-Neck imprint on September 25, 1971. After years of having white rock acts covering their most famed material, particularly, "Shout" and "Twist and Shout", the Isleys decided to do the same to music made famous by white artists such as Stephen Stills, Eric Burdon and Neil Young. Among the songs they covered were "Spill the Wine", "Love the One You're With", the social commentary medley of "Ohio" and "Machine Gun" (from Jimi Hendrix), "Fire and Rain" by James Taylor and Bob Dylan's "Lay Lady Lay". The Isleys' perseverance paid off when their covers of "Love the One You're With", "Lay Lady Lay" and "Spill the Wine" became charted hits. Bill Withers plays guitar on the Isleys' version of his "Cold Bologna". The only other recording of "Cold Bologna" is found on the 1973 Bill Withers live album, Live at Carnegie Hall as "Harlem/Cold Baloney". ^ "Givin' It Back > Charts & Awards > Billboard Singles" at AllMusic. Retrieved 17 October 2011. ^ Eder, Bruce. The Isley Brothers - Givin' It Back at AllMusic. Retrieved 17 October 2011. ^ Erlewine, Stephen Thomas (September 11, 2015). "The Isley Brothers: The RCA Victor and T-Neck Album Masters". Pitchfork. Retrieved December 23, 2015.